Dr. Paul Sraow has advanced training and expertise in pain management and provides outstanding care for patients who suffer from a variety of painful conditions, including low back pain, neck pain, verterbral fractures, compression fractures, joint pain, and sports injuries. Paul Sraow is a dedicated and committed double board certified Interventional Pain Management specialist assisting patients in Tempe, AZ. 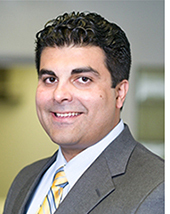 Dr. Sraow served as a resident specializing in Physical Medicine and Rehabilitation within the Wayne State University / Detroit Medical Center. He went on to complete a pain management fellowship within the department of anesthesia at the prestigious Washington University Medical Center in St. Louis. Dr. Sraow currently serves as the medical director at East Valley Pain Management. His clinical interests include back pain, back fractures, verterbral fracures, kyphoplasty, verterbroplasty, spincal cord stimulators, neck pain, sports injuries, and joint pain. He believes in a multidisciplinary approach to pain management, with an emphasis on interventional pain procedures, medical adjuvants, and physical therapy.